Disney World is always changing and 2014 brings about a major change to the way that guests avoid standing in lines. The old FASTPASS system is gone, and it has been replaced with FastPass+! Before you ever leave your home to start your Disney World Vacation, you can now rest easy that you have secured times to ride on Toy Story Midway Mania! and your other favorite Disney World attractions. In conjunction with the new MyDisneyExperience and other changes to how you plan for your Disney World vacation, FastPass+ is now an integral part of your pre-vacation planning process. Although everyone will have access to this system, there will be a definite advantage to anyone who is staying at an on-site Walt Disney World Resort Hotel and either already has Magic Your Way Park Tickets (or an Annual Pass) or purchases them as part of a package with the Resort room. Those that are staying on-site will be able, through the MyDisneyExperience part of the www.DisneyWorld.com website or through a mobile app will be able to register their vacation stay and make their FastPass+ selections up to 60 days in advance. Guests not staying on-site will be able to make FastPass+ selections inside the Disney theme parks on the day of their visit at a number of different kiosks. The concern will be availability for the most popular attractions. The ability to wait in the normal lines will still exist as well. The FastPass+ system remains free to all Disney World Guests just like its predecessor the FASTPASS. The website is not to difficult to use, but it does take a little time to become familiar with it. Once you are set up, then it is just a matter of following the on screen steps and making your selections. 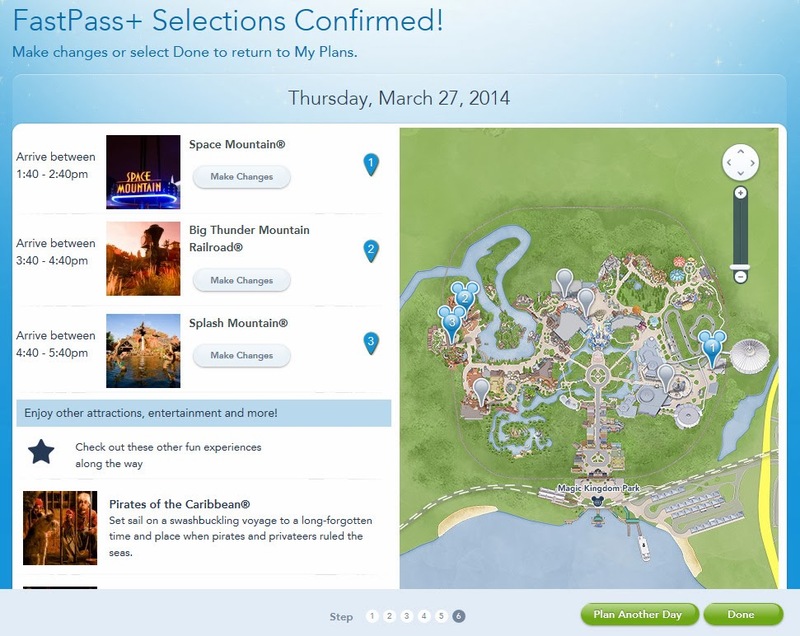 Once you go into the FastPass+ area, you start by selecting a day to plan. Once the day is selected you must choose one Disney World Theme Park (Magic Kingdom, Epcot, Disney's Hollywood Studios, or Disney's Animal Kingdom) to make your FastPass+ selections. Even if you are planning to Park Hop you may only get FastPasses for one park per day. Once you have chosen a theme park then you are given the opportunity to select up to 3 attractions to receive a FastPass for. After the initial selection you will be shown available options to choose from. Although the system is not quite as flexible as the Disney Dining Reservation system, it still does a good job. Each park has a different number of attractions that can be selected. They range from Attractions, Entertainment Options, Character Meet & Greets, or preferential locations for parades or fireworks shows. Here are the currently available options for each Disney park. The new FastPass+ system will take some getting used to, but for guests staying on site it will be a big benefit. The ability to get reservations for favorite attractions like Toy Story Midway Mania!, Space Mountain, Soarin', and others will be great for those that like to sleep in and not get to the parks right at opening. They now don't have to worry about arriving late and not being able to get a FASTPASS. Changes can be made at any time, including the day of use. So don't worry if you change your mind or your plans. There are definite advantages to the new system, so we will all have to wait and see how it works out. I think once people get used to it and how to use it, it will become very popular and may be considered an improvement over the old system. 0 comments to "FastPass+ The New Disney World Way To Avoid Waiting In Long Lines"